Colorado Peak Politics | SHUT UP, HICK: Give Us Negative Campaigning or Give Us Death! SHUT UP, HICK: Give Us Negative Campaigning or Give Us Death! Now that the Democratic primary for governor is over, along with that party’s infighting, hair pulling and temper tantrums tossed by the eventual winner and runner-up, Gov. Hickenlooper announces without a hint of irony his dismay at the signs of negativity creeping into the general election. What he’s trying to do is shift the blame away from Democrat Jared Polis — who turned negative in the primary — while suggesting that Walker Stapleton would somehow be in the wrong if he fights back when Polis realigns his sights on the Republican line. We know who “punched” first. He “punched” Democrat Cary Kennedy over and over, beat her campaign to death with bare fists clutched around $11 million of his own personal wealth. Now the richest Democrat in Congress is lining his personal war chest of more than $400 million with dynamite to detonate in Stapleton’s face in order to win this campaign. And Hickenlooper wants Stapleton to just sit there and take it while daydreaming about ponies and root beer floats. Going negative in politics is as American as apple pie. But, going negative and expecting the other side to just take it and not fight back? Dig up King George III and ask how well that worked out for him. Back in olden times, when newspapers weren’t ashamed to admit they were organs of political parties, they did the dirty work for the candidates. 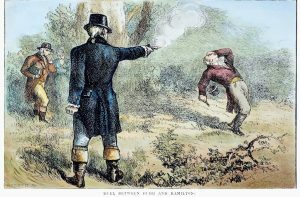 Hell, Americans fought duels to settle political scores. Check out this reenactment, of sorts, of early American political campaigning from Reason TV to gain a perspective of negativity through history. In the end, it won’t matter who started this political fight (Polis did). What matters, is that Stapleton will finish it for him.